09.30.2003 - Here's one of the nuisance critters that I commonly deal with. It's the Virginia Opossum. These animals are common in Florida. They are nomadic scavengers, though they will set up homes in and around human structures. Females will commonly live in attics in the late spring and summer, if they have young. I've dealt with many such cases this past season. However, in the autumn, they are most just scavenging about, stocking up on food for the winter. Even though it doesn't get cold down here, it's still an instinct. This opossum was living under a pool deck at a home in Longwood. It drove the dogs of the house crazy every night, and the homeowner was worried that the dog might attack the possum, or vice versa, and was tired of the noise. He tried many tactics to get the animal to leave, such as using mothballs, but it didn't work. The opossum stayed for several weeks, so he called me out, and I trapped and removed it. 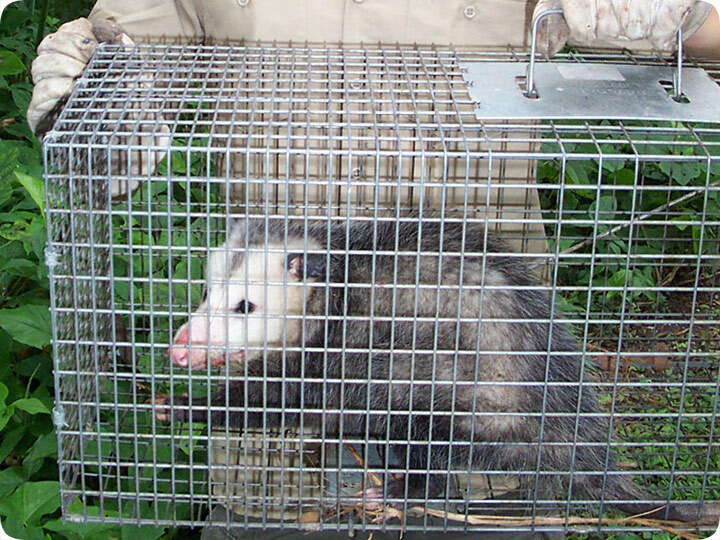 The key to possum trapping is to set the correct sized cage, such as the large 32" Havahart trap you see in the above photo, make sure the trap is flush to the ground, and bait it with almost anything, though smelly baits often work better for opossums. Generally, they're not too hard to trap. Firstly – you can try to catch the creature yourself. This will take some research, and although may be cheaper than hiring a professional, is almost guaranteed to take you longer, especially if you know nothing about the topic already. You are going to need to learn about the various traps – kill traps and humane traps, as well as the various baits, and even what to do once you have caught the creature. I advise a large size cage trap, and almost any bait will do. Secondly, you could try poison but this is not advised. You could accidentally kill other wild animals; the wrong ones, and even your own pets, as well as endangering small children. You will also have the worry about where the animal is actually going to die, which could leave you with a nasty smelly problem! Thirdly, and the best out of all of the choices, is to just a call a guy that knows what he is doing. There are plenty of pest and wildlife control professionals that you can call to give you a hand, and although this might be more expensive than the other options, at least you can guarantee that the job is done properly.